Site of ancient Tabernacle was declared a national heritage site last year. 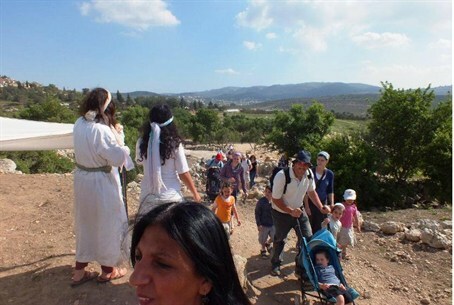 Thousands of people visited ancient Shilo, in the Binyamin region – site of the ancient Tabernacle that preceded the Jewish Temple – on Thursday, the second "Chol Hamoed" day of Pesach. The Tourism in Binyamin NGO said that several newly-appointed ministers and MKs were spotted among the visitors. They had come to see the extensive development of the site, after it was declared an official national heritage site last year. Intentionally or not, the pilgrims are renewing the ancient custom of making pilgrimage to the site of the Tabernacle – and later, the Temple – on the holidays of Pesach, Sukkot and Shavuot. The visitors enjoyed a tour of the ancient city, where street theater performances and musicians made the atmosphere more lively, and various workshops and activities were offered for children and adults. Bicyclists used Shilo as a "launch pad" for tours of the area.